A characteristic general attitude or function. Jung believed that the early distortion of type due to parental or other environmental influences can lead to neurosis in later life. A system in which individual attitudes and behavior patterns are categorized in an attempt to explain the differences between people. 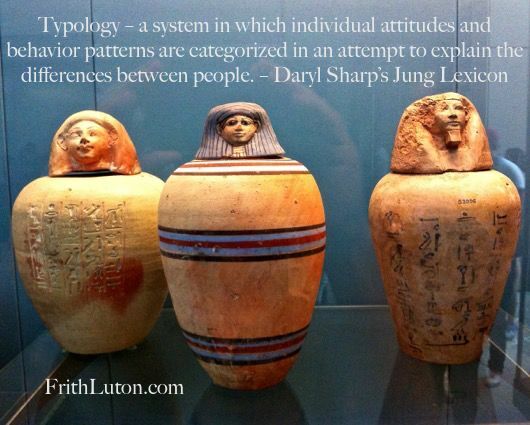 Jung’s model of typology grew out of an extensive historical review of the type question in literature, mythology, aesthetics, philosophy and psychopathology. Whereas earlier classifications were based on observations of temperamental or physiological behavior patterns, Jung’s model is concerned with the movement of energy and the way in which one habitually or preferentially orients oneself in the world. Jung differentiated eight typological groups: two personality attitudes – introversion and extraversion – and four functions – thinking, sensation, intuition and feeling, each of which may operate in an introverted or extraverted way. Introversion and extraversion are psychological modes of adaptation. In the former, the movement of energy is toward the inner world. In the latter, interest is directed toward the outer world. In one case the subject (inner reality) and in the other the object (things and other people, outer reality) is of primary importance. The crucial factor in determining whether one is introverted or extraverted, as opposed to which attitude is currently operative, is not what one does but rather the motivation for doing it – the direction in which one’s energy naturally, and usually, flows. Whether a person is predominantly introverted or extraverted only becomes apparent in association with one of the four functions, each with its special area of expertise: thinking refers to the process of cognitive thought, sensation is perception by means of the physical sense organs, feeling is the function of subjective judgment or valuation, and intuition refers to perception via the unconscious. Briefly, the sensation function establishes that something exists, thinking tells us what it means, feeling tells us what it’s worth, and through intuition we have a sense of its possibilities. In this way we can orient ourselves with respect to the immediate world as completely as when we locate a place geographically by latitude and longitude. The four functions are somewhat like the four points of the compass; they are just as arbitrary and just as indispensable. Nothing prevents our shifting the cardinal points as many degrees as we like in one direction or the other, or giving them different names. It is merely a question of convention and intelligibility. Jung believed that any one function by itself is not sufficient for ordering our experience of ourselves or the world around us; all four are required for a comprehensive understanding. The ideal is to have conscious access to the function or functions appropriate for particular circumstances, but in practice the four functions are not equally at the disposal of consciousness. One is invariably more differentiated, called the superior or primary function. The function opposite to the primary function is called the fourth or inferior function. The terms “superior” and “inferior” in this context do not imply value judgments. No function is any better than any of the others. The superior function is simply the most developed, the one a person is most likely to use; similarly, inferior does not mean pathological but merely less used compared to the favored function. Moreover, the constant influx of unconscious contents into consciousness is such that it is often difficult for oneself, let alone an outside observer, to tell which functions belong to the conscious personality and which to the unconscious. What happens to those functions that are not consciously brought into daily use and therefore not developed? Jung described two of the four functions as rational (or judging) and two as irrational (or perceiving). Thinking, as a function of logical discrimination, is rational. So is feeling, which as a way of evaluating our likes and dislikes can be quite as discriminating as thinking. Both are based on a reflective, linear process that coalesces into a particular judgment. Sensation and intuition are called irrational functions because they do not depend on logic. Each is a way of perceiving simply what is: sensation sees what is in the external world, intuition sees (or “picks up”) what is in the inner world. Besides the primary function, there is often a second, and sometimes a third, auxiliary function that exerts a co-determining influence on consciousness. This is always one whose nature, rational or irrational, is different from the primary function. Jung’s model of typology is the basis for modern type tests, such as the Myers-Briggs Type Indicator (MBTI) and the Singer-Loomis Personality Profile, used in organizational settings.